Due to the competitive nature of this document, the information contained within is considered to be of a proprietary and confidential nature and shall not be copied, printed or otherwise reproduced without the express written permission of CBRE. To begin work it is a requirement to check in and check out when starting and completing a job. You can use the IVR tool, the Check In/Check Out app from your smart device, or have your back office log into the WON and use the tool. 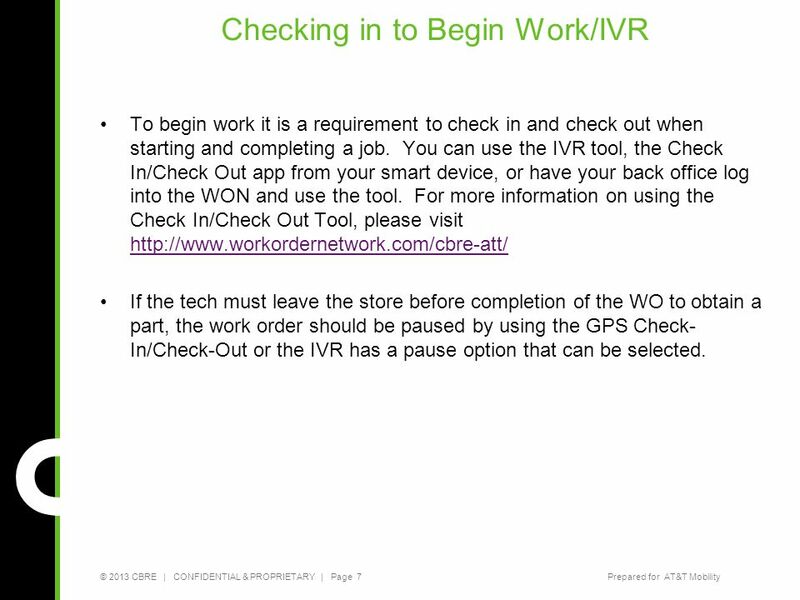 For more information on using the Check In/Check Out Tool, please visit If the tech must leave the store before completion of the WO to obtain a part, the work order should be paused by using the GPS Check-In/Check-Out or the IVR has a pause option that can be selected. If your team members do not have tablets or PDAs your home office should be contacted to make any required adjustments in the system. 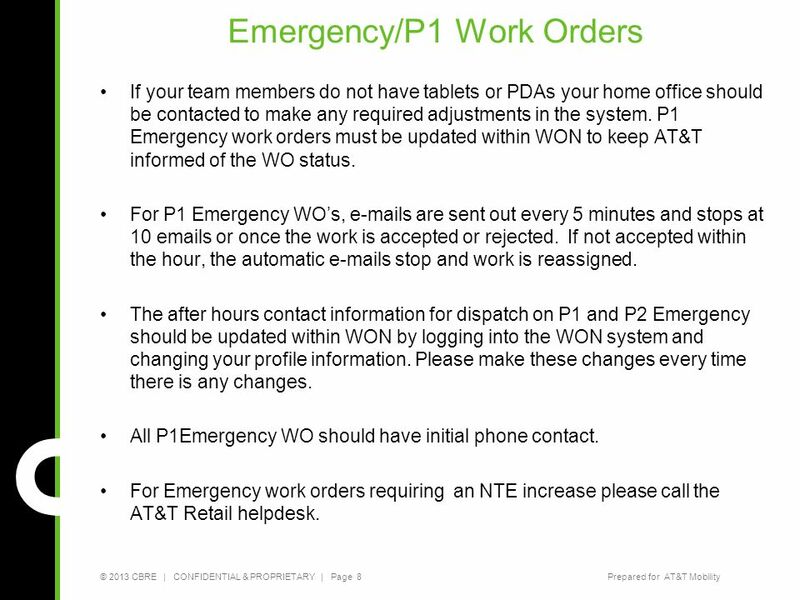 P1 Emergency work orders must be updated within WON to keep AT&T informed of the WO status. For P1 Emergency WO’s, s are sent out every 5 minutes and stops at 10 s or once the work is accepted or rejected. If not accepted within the hour, the automatic s stop and work is reassigned. The after hours contact information for dispatch on P1 and P2 Emergency should be updated within WON by logging into the WON system and changing your profile information. Please make these changes every time there is any changes. All P1Emergency WO should have initial phone contact. For Emergency work orders requiring an NTE increase please call the AT&T Retail helpdesk. 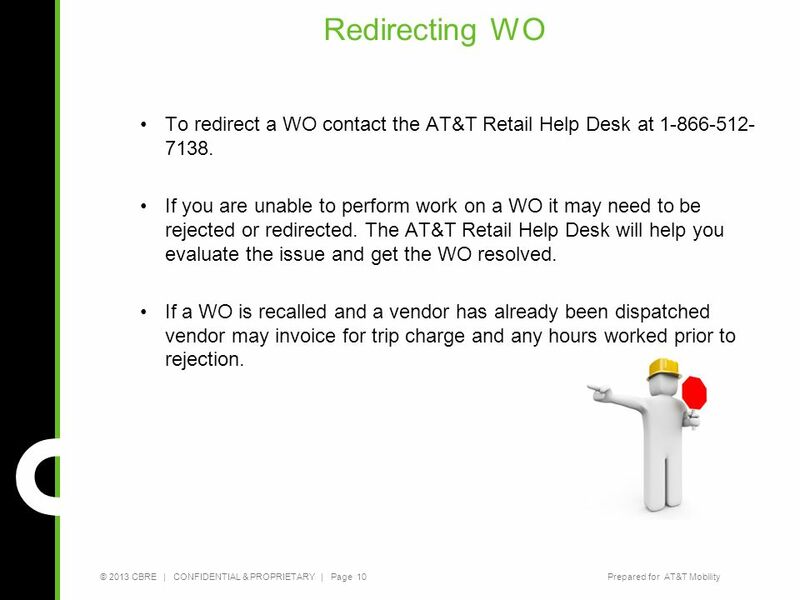 10 Redirecting WO To redirect a WO contact the AT&T Retail Help Desk at If you are unable to perform work on a WO it may need to be rejected or redirected. 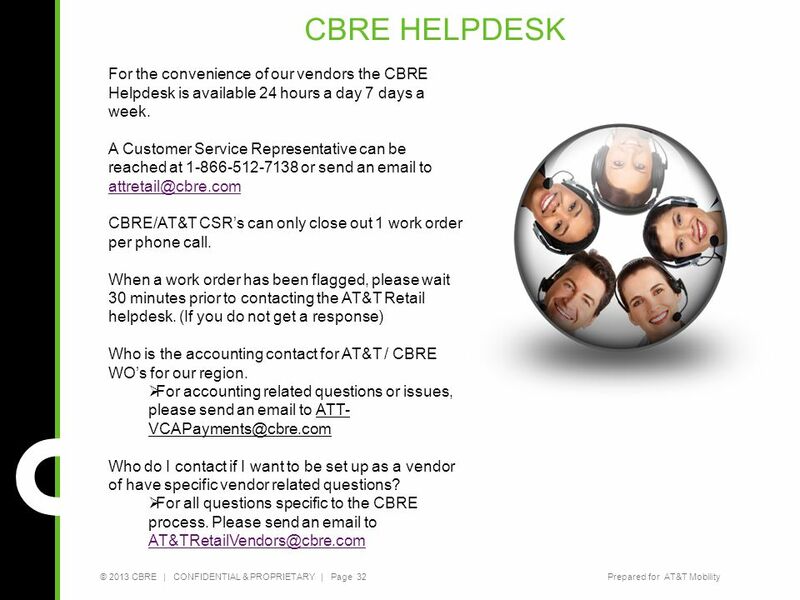 The AT&T Retail Help Desk will help you evaluate the issue and get the WO resolved. If a WO is recalled and a vendor has already been dispatched vendor may invoice for trip charge and any hours worked prior to rejection. 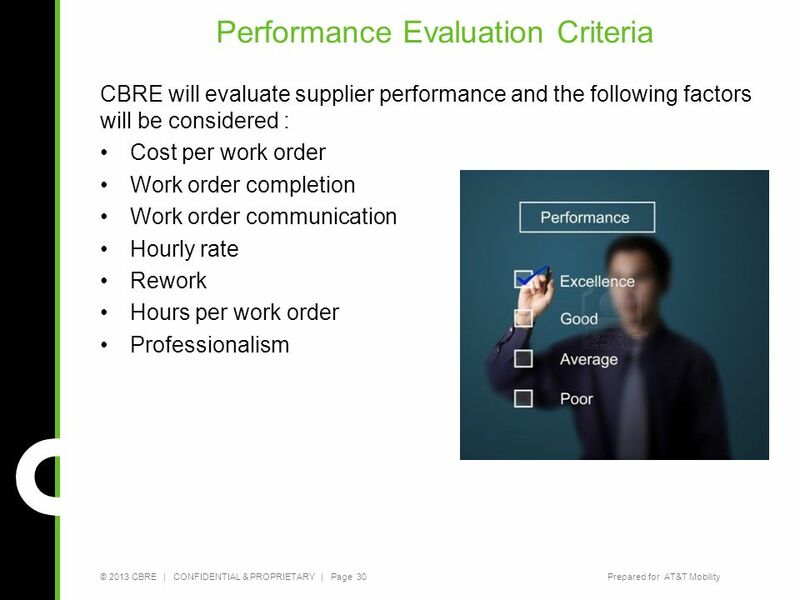 Survey Proposal Every work order received requires investigation, pricing and completion of work. 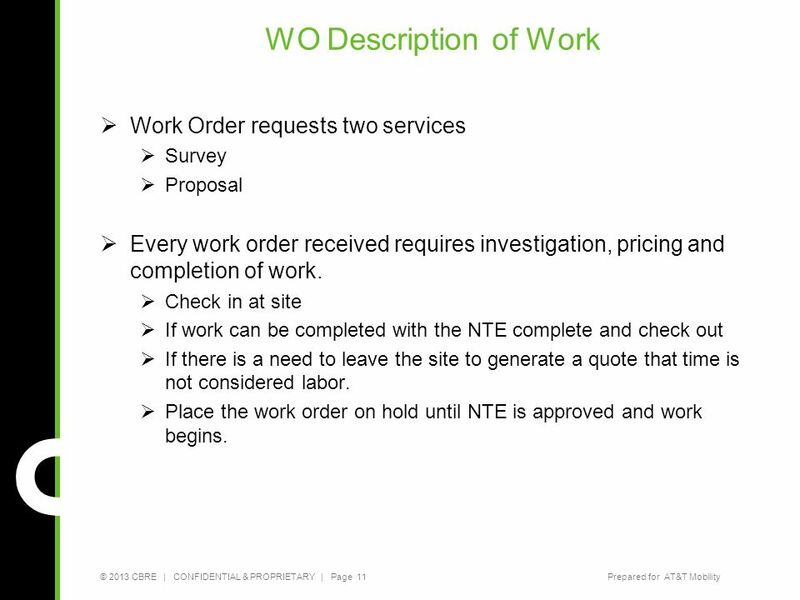 Check in at site If work can be completed with the NTE complete and check out If there is a need to leave the site to generate a quote that time is not considered labor. Place the work order on hold until NTE is approved and work begins. 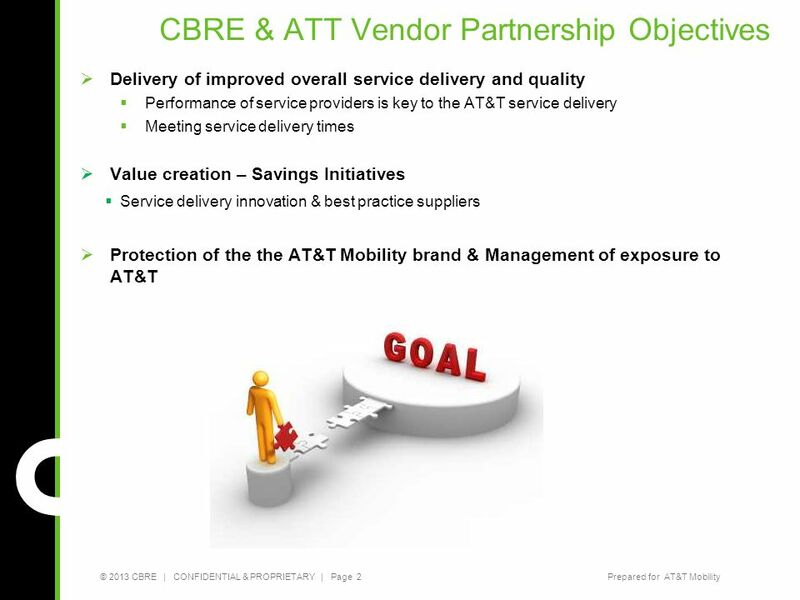 Work Evaluated by Vendor and Exceeds NTE Amount Quote Submitted by Vendor Through WON System Once loaded the appropriate person on the CBRE and/or the AT&T team will review and approve the quote. If more information is needed to support the quote an is sent to the vendor to request information. If approved, vendor may commence work at approved amount and close out WO once complete. 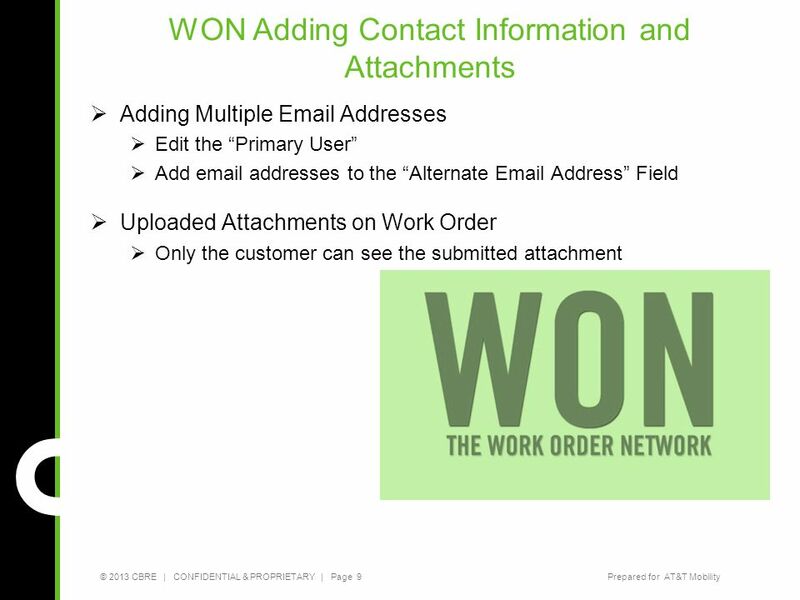 If NTE is not approved vendor will receive a call indicating a cancellation of WO and work will be reassigned. In event that the NTE is not approved, vendor will be able to invoice for time on site. All invoices must be entered into the WON system. For Emergency work orders or when a tech is onsite and can complete repairs without additional trip charges being incurred, please call the AT&T Retail Helpdesk to submit quote for approval. (Vendor must still submit the quote in WON for approval in order to invoice. All initial charges incurred prior to the request for NTE will be paid even if the additional repair quote is rejected. The technician is able to charge 30 minutes labor for wait time while the job is paused. All quotes that are submitted for an NTE must be backed up by site investigation. Do quote work that exceeds NTE prior to beginning work. In some cases, for high priority work orders, a quote may be discussed and approved verbally, but will need to be followed up with an official quote as soon as possible. Do pause WO to get additional materials. 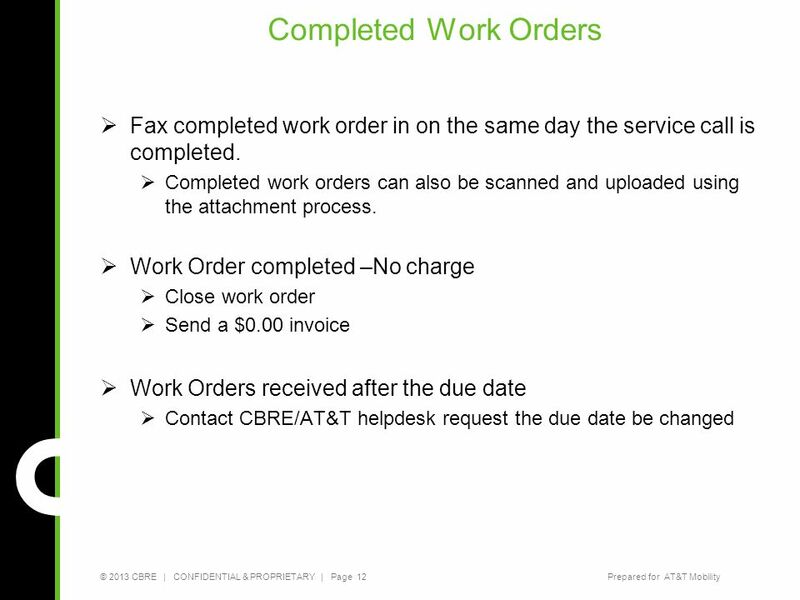 If the materials must be ordered or are on backorder and this will affect the work getting completed by the due date, place the WO on hold and update the system with notes. Do call the Helpdesk immediately and state that you need an urgent NTE increase approval. This will keep from having to pay for another trip charge and save AT&T money. Do contact the helpdesk if NTE has not been approved within one hour of receipt of P1 Emergency WO call the ATT retail Helpdesk at Do contact the store directly if you are unsure of store hours. 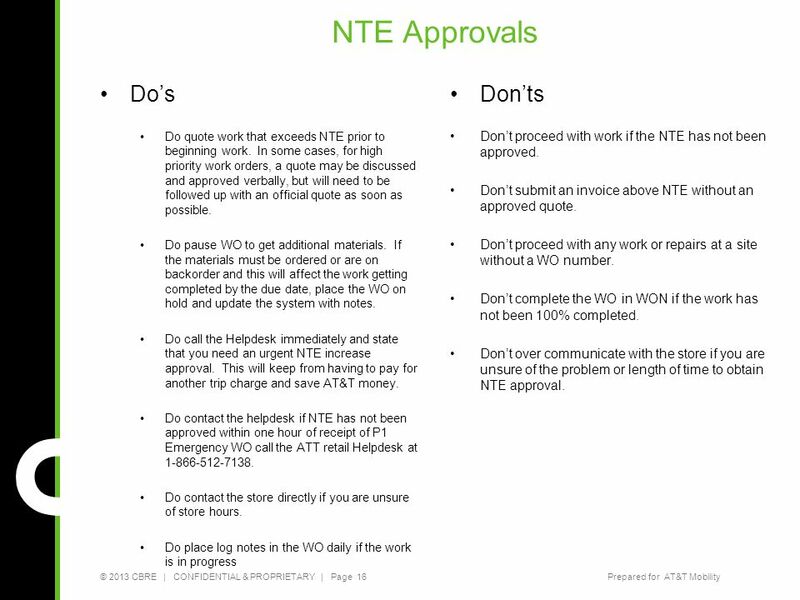 Do place log notes in the WO daily if the work is in progress Don’ts Don’t proceed with work if the NTE has not been approved. 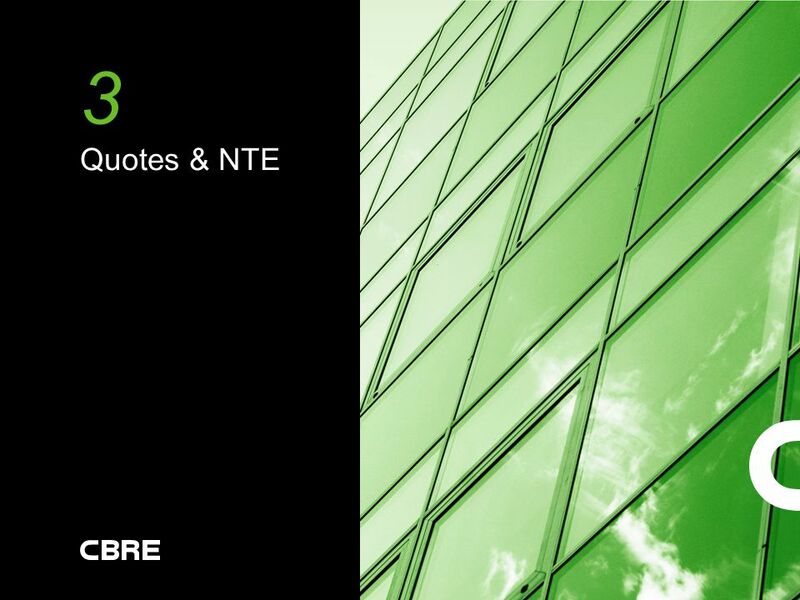 Don’t submit an invoice above NTE without an approved quote. Don’t proceed with any work or repairs at a site without a WO number. Don’t complete the WO in WON if the work has not been 100% completed. Don’t over communicate with the store if you are unsure of the problem or length of time to obtain NTE approval. 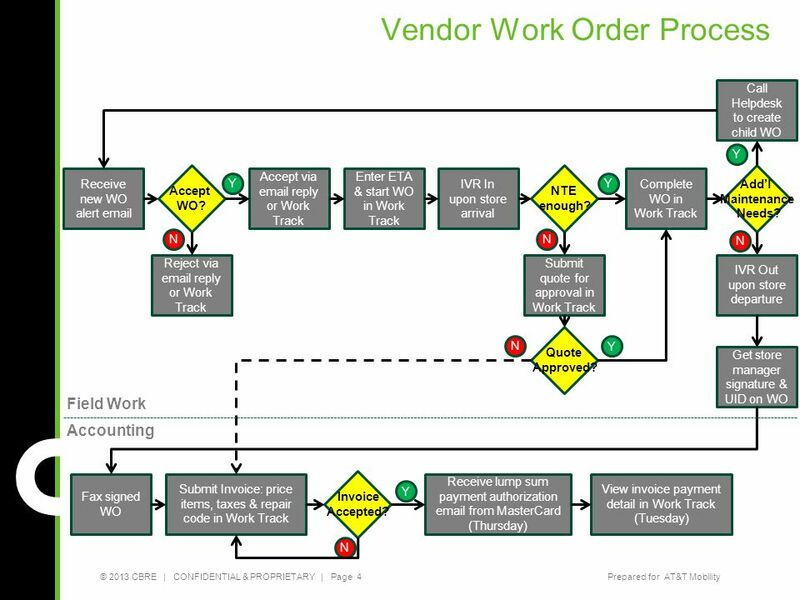 17 NTE When a vendor submits a quote the work order will automatically be flagged. 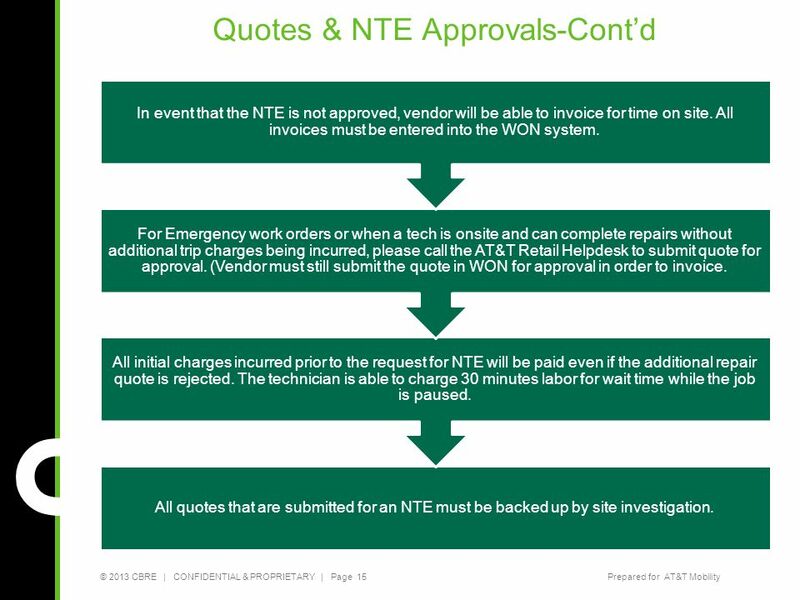 The NTE can not be changed onsite-it must go through the quote process. 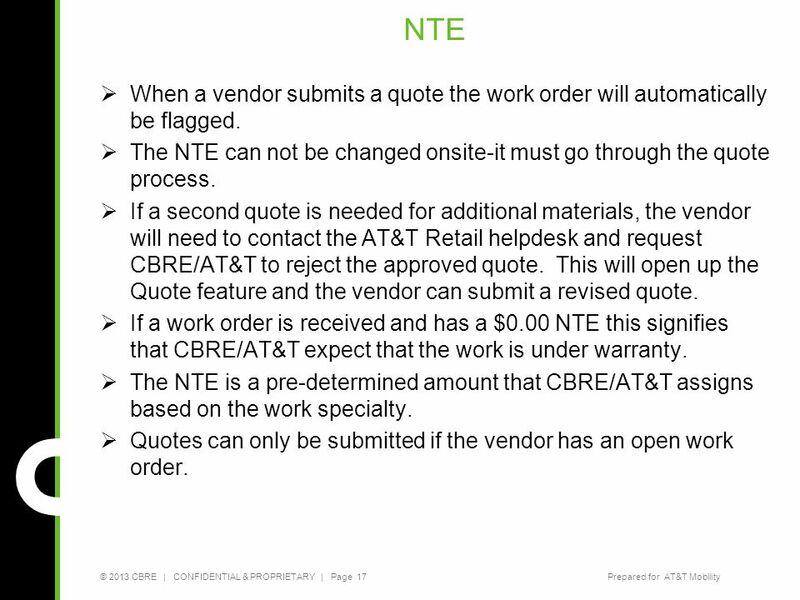 If a second quote is needed for additional materials, the vendor will need to contact the AT&T Retail helpdesk and request CBRE/AT&T to reject the approved quote. This will open up the Quote feature and the vendor can submit a revised quote. 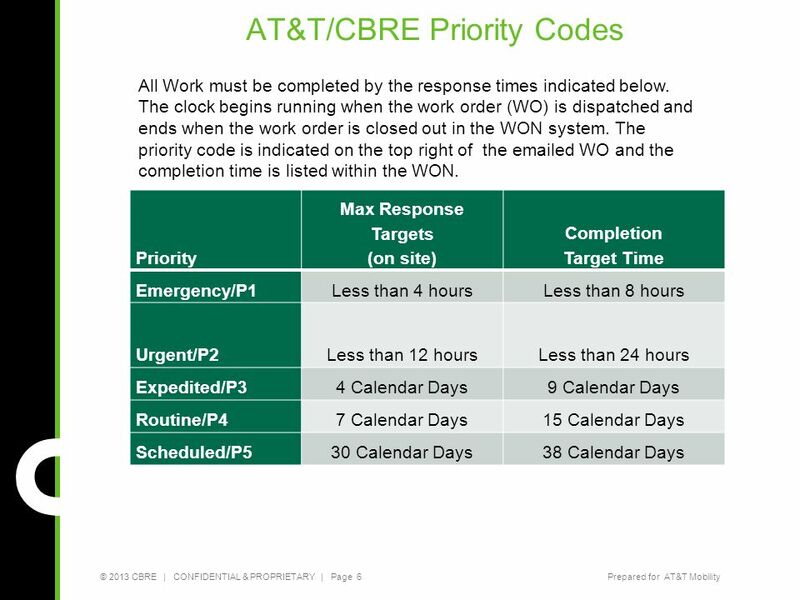 If a work order is received and has a $0.00 NTE this signifies that CBRE/AT&T expect that the work is under warranty. 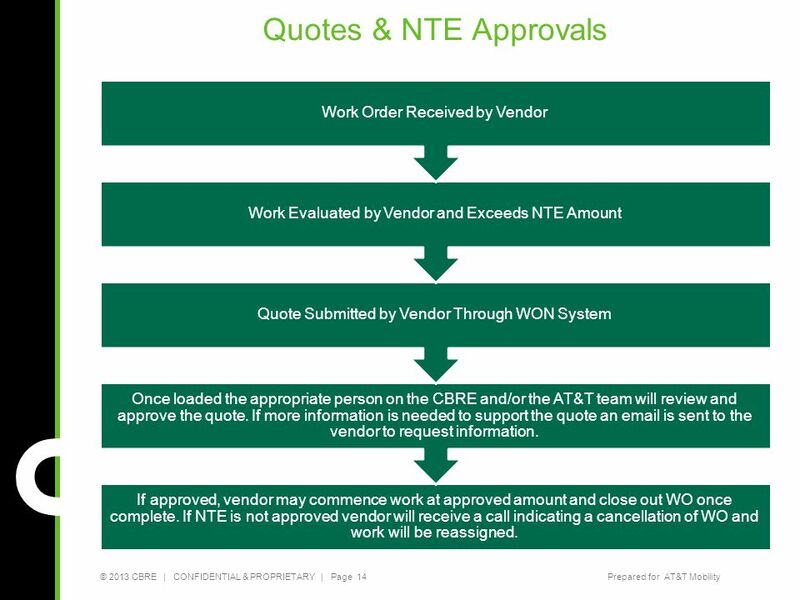 The NTE is a pre-determined amount that CBRE/AT&T assigns based on the work specialty. Quotes can only be submitted if the vendor has an open work order. 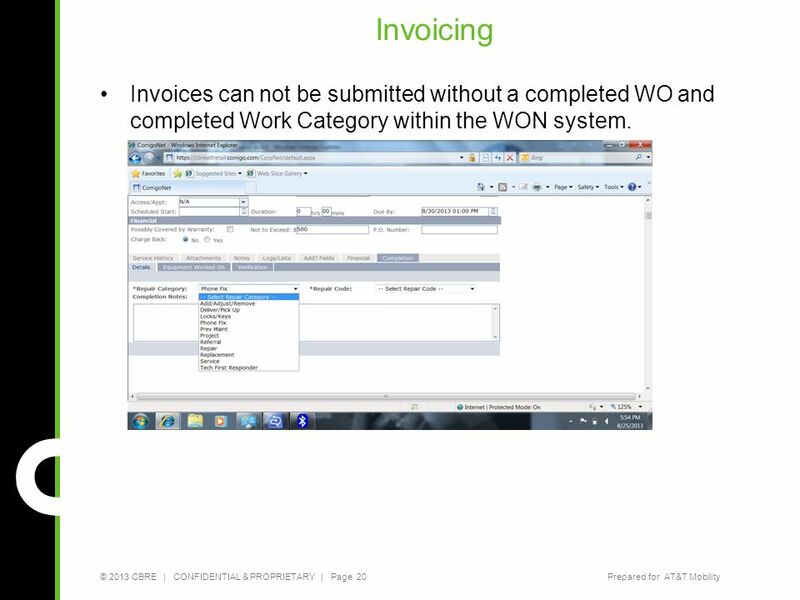 20 Invoicing Invoices can not be submitted without a completed WO and completed Work Category within the WON system. 21 Invoice Exception If a WO does not require payment please complete the WO as normal and submit an invoice for $0. 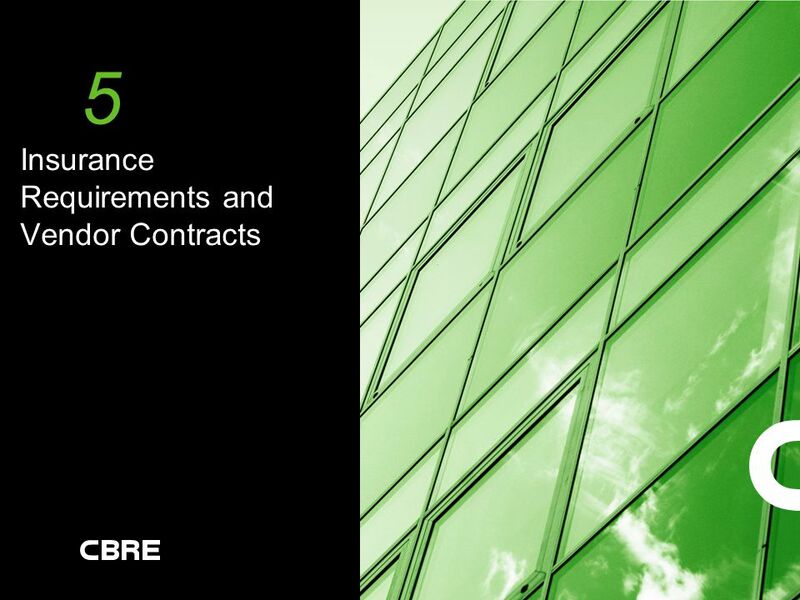 This will allow CBRE to close out the WO and Invoice process within WON. Q: Do we only need to attach the hard copy of the invoice or do you require more documentation. A: All invoice detail shall be provided in the WON system. Scanned copies of receipts for material purchases and other expenses should be included as an attachment to the invoice. 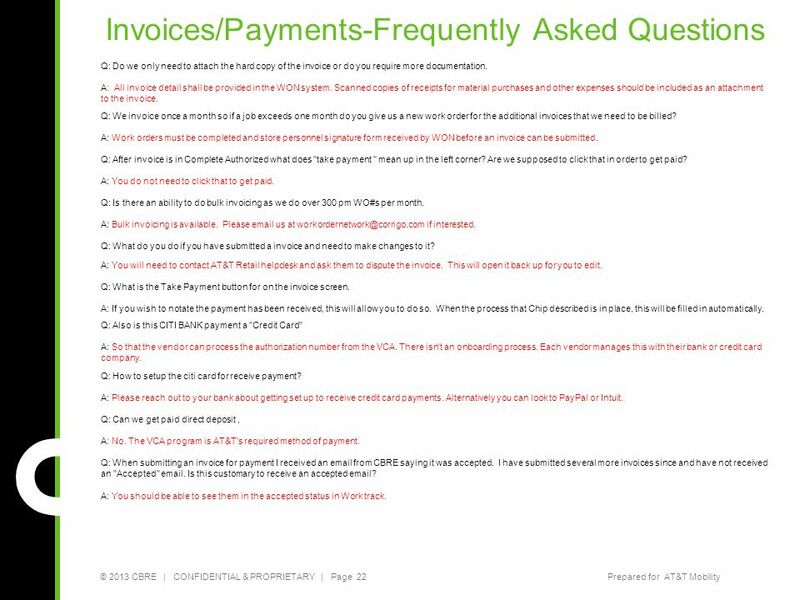 Q: We invoice once a month so if a job exceeds one month do you give us a new work order for the additional invoices that we need to be billed? A: Work orders must be completed and store personnel signature form received by WON before an invoice can be submitted. 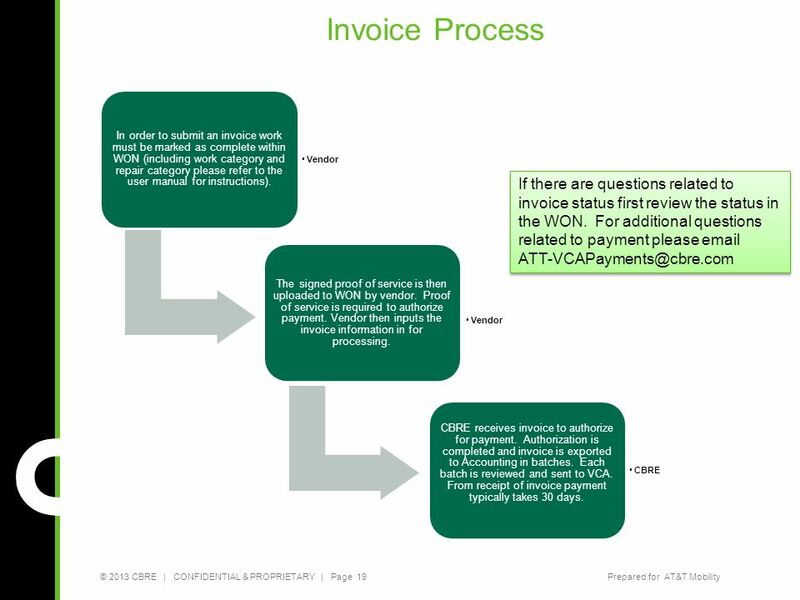 Q: After invoice is in Complete Authorized what does "take payment " mean up in the left corner? Are we supposed to click that in order to get paid? A: You do not need to click that to get paid. Q: Is there an ability to do bulk invoicing as we do over 300 pm WO#s per month. A: Bulk invoicing is available. Please us at if interested. Q: What do you do if you have submitted a invoice and need to make changes to it? A: You will need to contact AT&T Retail helpdesk and ask them to dispute the invoice. This will open it back up for you to edit. Q: What is the Take Payment button for on the invoice screen. A: If you wish to notate the payment has been received, this will allow you to do so. When the process that Chip described is in place, this will be filled in automatically. 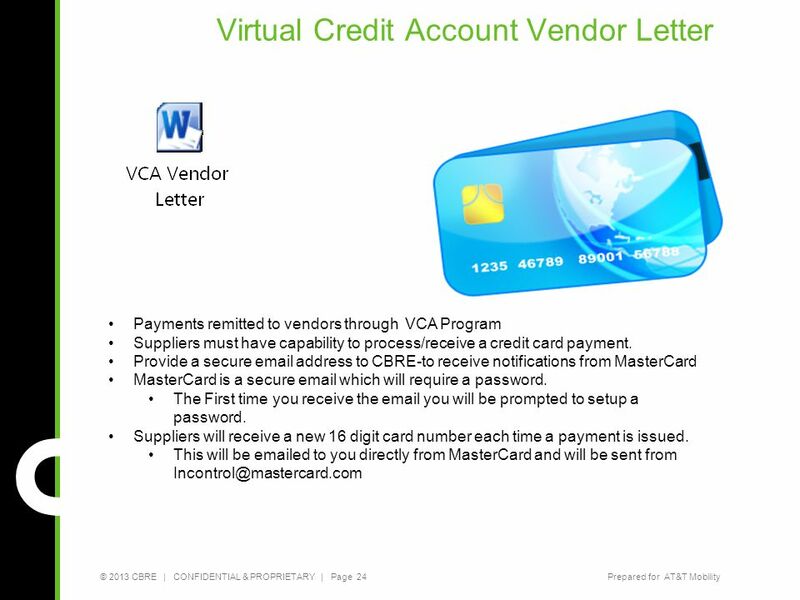 Q: Also is this CITI BANK payment a "Credit Card" A: So that the vendor can process the authorization number from the VCA. There isn't an onboarding process. Each vendor manages this with their bank or credit card company. Q: How to setup the citi card for receive payment? A: Please reach out to your bank about getting set up to receive credit card payments. Alternatively you can look to PayPal or Intuit. Q: Can we get paid direct deposit , A: No. The VCA program is AT&T's required method of payment. Q: When submitting an invoice for payment I received an from CBRE saying it was accepted. I have submitted several more invoices since and have not received an "Accepted" . Is this customary to receive an accepted ? A: You should be able to see them in the accepted status in Work track. Invoice remittance information will be accessible through the work order network in the near future. It is currently not available, we are working on integrating the two systems. We hope to have this completed by the middle of next week. Below is the process you will follow when the integration is complete. 1. 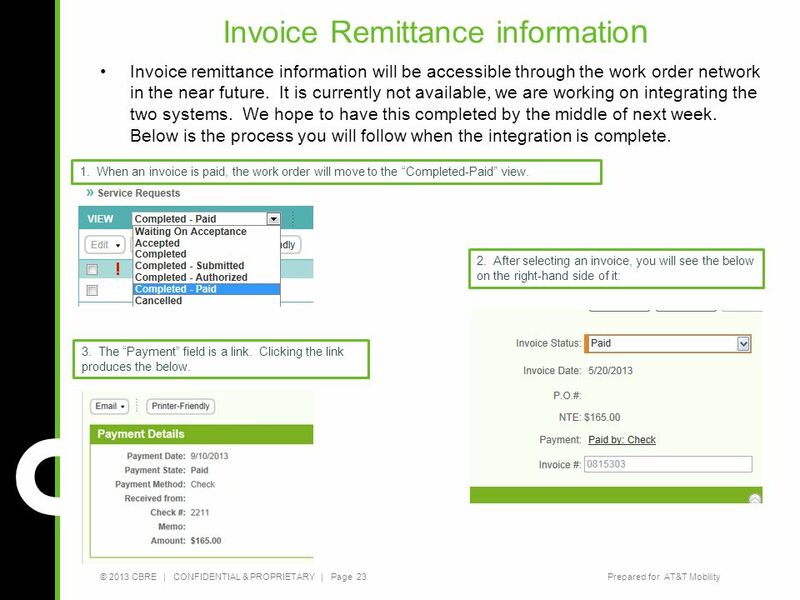 When an invoice is paid, the work order will move to the “Completed-Paid” view. 2. 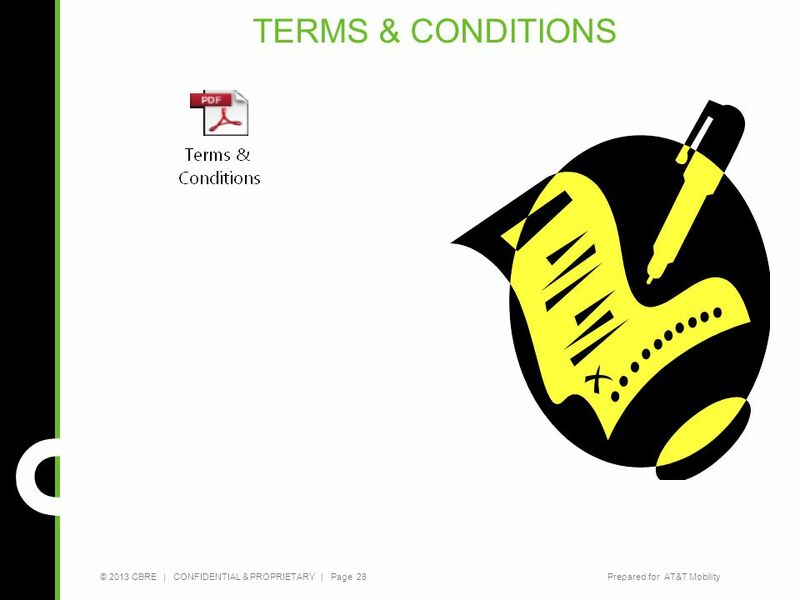 After selecting an invoice, you will see the below on the right-hand side of it: 3. The “Payment” field is a link. Clicking the link produces the below. In an effort to strengthen CBRE’s risk management program and ensure that we are in compliance with federally mandated laws and regulations, CBRE has partnered with Global Risk Management Solutions (GRMS), a Supplier Screening and Certificate of Insurance tracking and management provider. 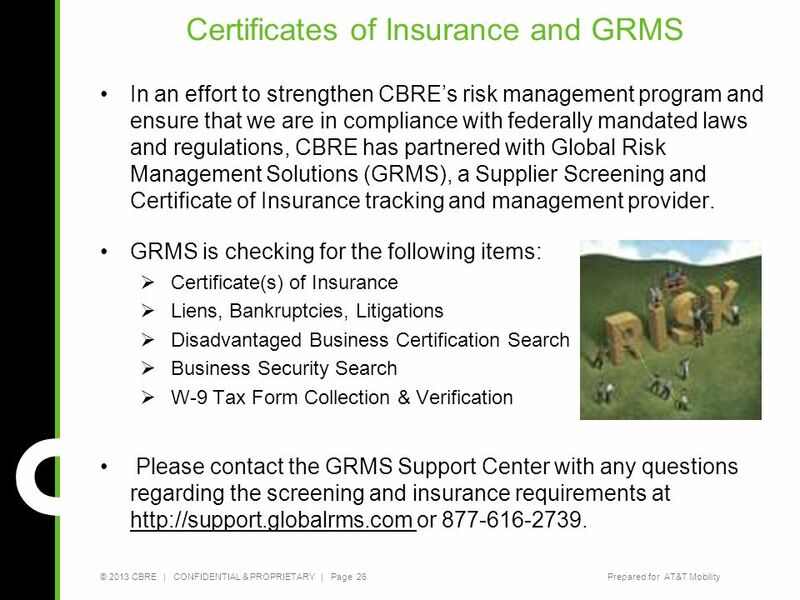 GRMS is checking for the following items: Certificate(s) of Insurance Liens, Bankruptcies, Litigations Disadvantaged Business Certification Search Business Security Search W-9 Tax Form Collection & Verification Please contact the GRMS Support Center with any questions regarding the screening and insurance requirements at or All service vendors* must enroll and complete the screening process through GRMS in order to become approved vendors for CBRE/ AT&T Retail. CBRE’s Vendor Screening Program is designed to streamline the collection and management of key information regarding regulatory and compliance status, as well as business operations of our suppliers. 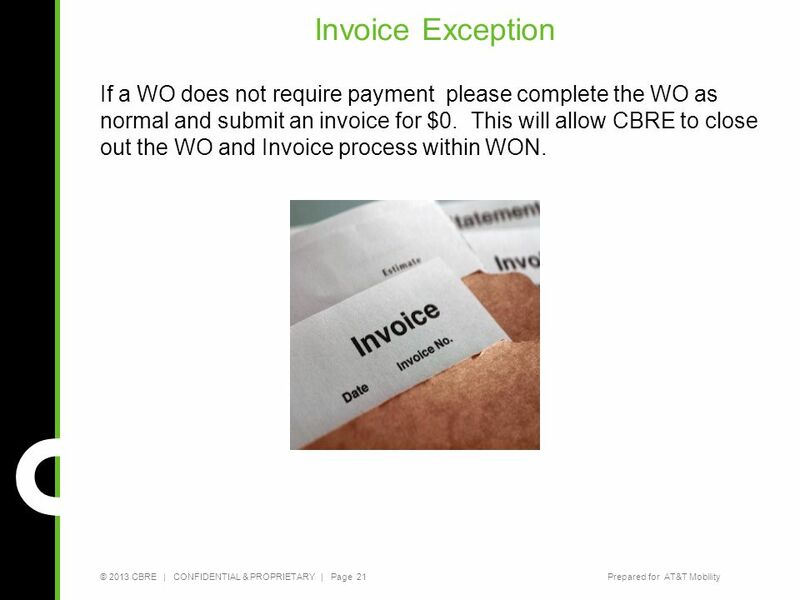 Once a COI has expired and no updated COI has been submitted CBRE will no longer be able to dispatch WO’s to a vendor. It is imperative that COI is kept up to date. GRMS will send an 30 days prior to expiration date. Insurance Limit Requirements General Liability Limits $1,000,000/$2,000,000 Auto Liability Limits	$1,000,000 Umbrella Liability Limits	$1,000,000 Workers Compensation –Each Accident $500,000 Each Disease $500,000 Disease Limit $500,000 Additional Insurance Requirements CBRE Inc., AT&T Services, Inc. and their respective affiliates, officers and employees must be added as Additional Insured's on General Liability policy. 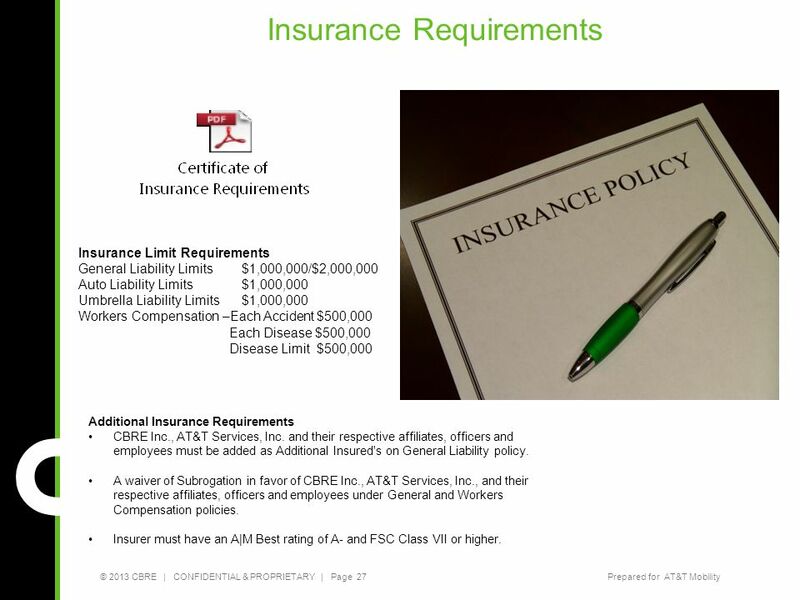 A waiver of Subrogation in favor of CBRE Inc., AT&T Services, Inc., and their respective affiliates, officers and employees under General and Workers Compensation policies. Insurer must have an A|M Best rating of A- and FSC Class VII or higher. 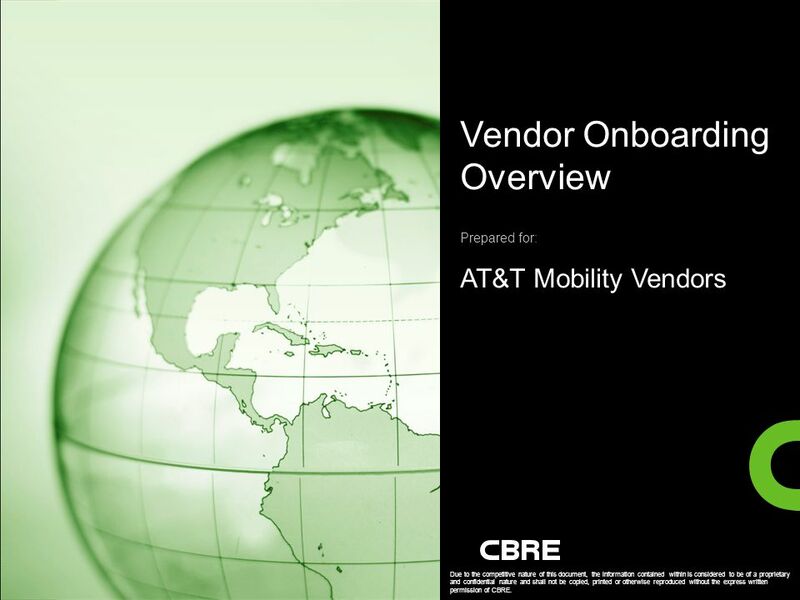 Download ppt "Vendor Onboarding Overview Prepared for: AT&T Mobility Vendors"
The innovative payment website for parents and schools Parents Tour Rev: 16Mar12. Five Steps in 5 Minutes Close deals faster, more easily, more often! 1.Start a Quote: Input deal amounts and review the available lease options 2.Create. What’s New in GE Part 1 (AR, AP, PO, Job Cost Presented by: Derek Kratz. El Vis – Visman’s Electronic VISitor management system offers a module for Control of Contractors. The system is offered on a secure, maintained and controlled. Smart Connect – Supplier Portal Training Module 2 – Creation of Service Confirmation. Tele’Ware Software Application. Helping you manage your clients…. ETravel Authorization / Reimbursement Overview SOLAR Financials x 6685 July 8, 2014. Accounts Payable Training Vendor Information & Voucher Preparation Revised 10/16/2014. 1.7.6.G1 © Family Economics & Financial Education –March 2008 – Financial Institutions – Online Banking Funded by a grant from Take Charge America, Inc.
Dispatch Load Board. Is Your Company Looking For A Better Way To Manage Itself Logistically? _______________________________________________________________. Child Care Subsidy Program Online Billing Provider Training Spring 2016.